The focus in the two years since the first Public Service Reform Plan was published has been on making early progress in implementing many actions in the Reform Plan and also on putting in place the structures, processes and business cases to support the delivery of reform centrally and across the Public Service over the medium and long term. Many of the major reform projects are now moving into the implementation stage, with significant benefits to be realised over the coming years. 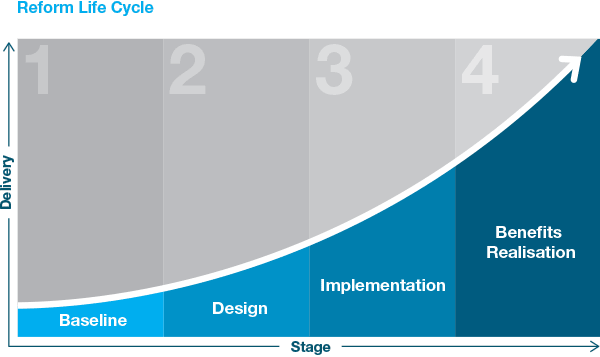 The chart below sets out the typical life cycle of a major reform project. As a key element of the Government’s strategic response to the crisis, the initial emphasis has primarily, though not exclusively, been on reducing costs and delivering greater value for money. This has been challenging but, as set out in the accompanying progress report, significant progress has been made. The next phase of reform will maintain the emphasis on reducing costs and increasing efficiency. However, alongside this, there will be a move to a much stronger focus on the delivery of the best possible outcomes for citizens and business customers. Many of the major reform projects are now moving into the implementation stage, with significant benefits to be realised over the coming years.